Families throughout the Phoenix Metropolitan Area are guaranteed to fall in love with the all-new 2018 Honda Odyssey. 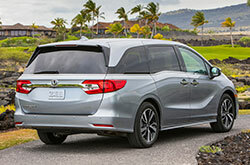 Redesigned from head to toe, the latest example features a brand-new body and chassis design that improves safety, ride comfort and handling, making the Odyssey the perfect family vehicle. 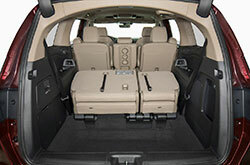 A number of exterior modifications and a host of new technologies also boost the minivan's appeal and take its capabilities to the next level. Speaking of the exterior, the Odyssey's new LED front headlights, flying wing front grille, sporty front fascia and Active Grille Shutter are top modifications buyers will notice on the model. It also receives hidden sliding rear doors, a "floating" D-pillar, new LED taillights and an optional power tailgate designed for easy access. Additional updates on the 2018 Honda Odyssey in Phoenix include new powertrains and interior amenities. You can read about them in our 2018 Honda Odyssey review below. If technology is what you're looking for in a family car, then you'll want to take a look at the new Honda Odyssey. It's available with a bundle of new features, including CabinWatch and CabinTalk, which allow you to monitor the kiddos, and new Display Audio that offers improved voice recognition and customizable apps. In-car 4G LTE Wi-Fi is also optional to those who plan on streaming video on the go. An available CabinControl app is offered as well, allowing owners to access select car features from their smartphone. 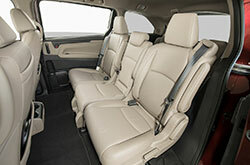 To improve comfort, Magic Slide seats are available on the minivan, providing easy access to the third row and increasing comfort. 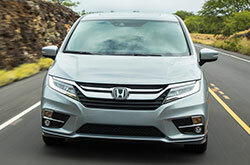 Other available features include heated front seats, heated side mirrors, a heated steering wheel, rain-sensing wipers and auto beam headlights, which have been noted in several 2018 Honda Odyssey reviews. A brand-new 3.5L V6 engine equipped with direct injection is standard on the Odyssey. Delivering 280 horsepower, the powerplant is matched to a nine-speed automatic transmission on base models, while upper trims receive a 10-speed automatic transmission. Both engines send power to the vehicle's front wheels to deliver a first-class driving experience. Most models of the Odyssey come with standard Honda Sensing. The safety suite is loaded with a variety of driver-assist technology, including Road Departure Mitigation, Adaptive Cruise Control, Lane Keeping Assist and Collision Mitigation Braking. Additional available safety equipment on the 2018 Honda Odyssey in Phoenix includes front and rear parking sensors, Rear Cross Traffic Monitoring, blind spot information and an Electric Parking Brake. 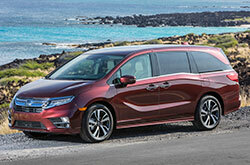 Don't just look at the 2018 Nissan Quest, Kia Sedona, Toyota Sienna and the Chrysler Pacifica when on the hunt for a new car; also remember to take a look at the 2018 Honda Odyssey near Phoenix. It could be a definite match for you, due to its excellent in-car technologies and exciting persona. 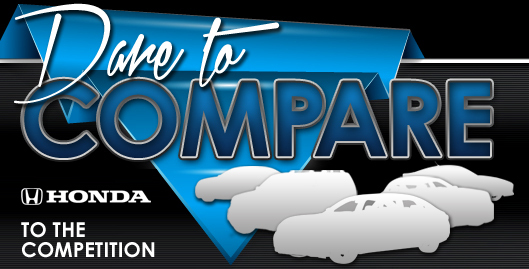 After using our 2018 Honda Odyssey review and compare page, view new lease offers online! We're a in-town car dealer with many lease offers on new and used car models, including the Honda Odyssey. To help you make a sound decision when purchasing your next car, we've included this 2018 Honda Odyssey review right here on our site, making it easy to find the info you need. Stop by our dealership in Phoenix, AZ, and explore the brand-new Honda Odyssey upfront. Want to see it in action before you visit? Take a look at our video clip to see its spectacular exterior design.